I am excited out of my MIND!!! I’m so proud to say that my school district is getting very progressive about the way it offers professional development. We’re moving away from the “Sit & Get” workshop format and starting to explore options that involve choice! Our first HUGE foray into this world involves something powerful and amazing called Digital Badges. If you happen to Google the term Digital Badges, or even follow the hashtag on Twitter, you’ll see that there are all kinds of platforms for creating, issuing, and using Digital Badges. You’ll also see that it is becoming an increasingly popular way to motivate people for all kinds of things. Businesses, colleges, leagues, clubs, MOOCs, and more are using these. Heck, even my Fitbit uses Digital Badges to do its best to keep me motivated! In our district, we’re using a badging site called Credly. It’s free! It allowed for our district to set up an account and create a set of digital badges. 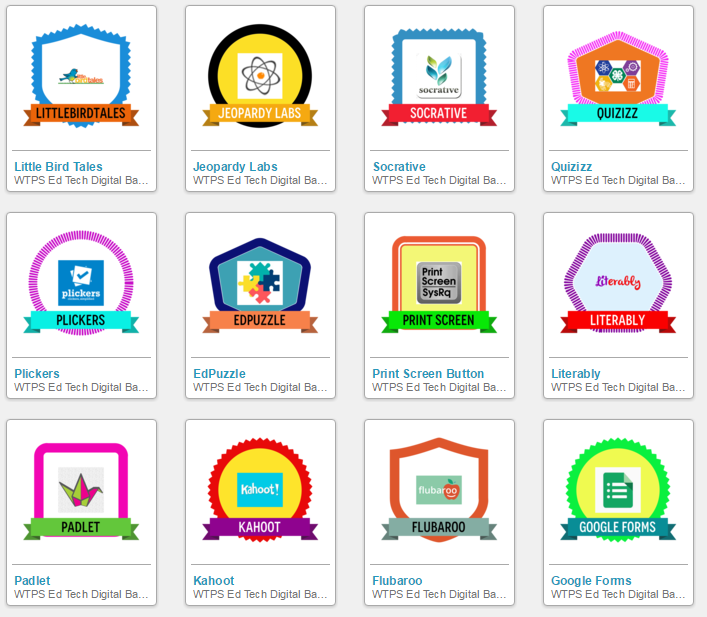 Each badge represents some skill to be learned involved the learning AND APPLICATION of an ed tech tool. For instance, there is a badge for the site Wordle, which teaches badge applicants how to create cool word clouds with their students at the website wordle.net. There’s another badge for a cool web tool called Thinglink, which teaches badge applicants to create an interactive image with hyperlinks to all sorts of unit activities. There’s even a Digital Badge that teaches folks how to use that PRNT SCRN button on the keyboard! There are about 20 starter badges there now, but the site is designed to grow – get this – by CROWDSOURCING THE GENIUS OF THE USERS! This is undoubtedly the best part! The second to the last badge on the page is a Screencasting Digital Badge. It teaches users how to create their own screencast to explain a new web tool to others. To claim this badge (or any badge), users must submit specified evidence. In the case of the Screencasting Digital Badge, an applicant must submit the link the actual video that they have created. These are just a few of a growing list of badges that may be earned in our district! As you can see from the image above, each badge on our district’s website has a cute little picture of the badge itself, a link to the website, a brief description of what the site is or does, and a link to claim the badge at Credly. That Credly link gives more information about what specific evidence is required for each individual badge. For the most part, evidence involves actual proof of the tool having been used by a class in some way. Photos, videos, links to student-created work, screenshots of class dashboards with online scores/results, Word documents or actual student samples – these are all indicators of true application. These are the real credentials – the ‘metadata’ – that back up a Digital Badge and make it so much more than just a cute graphic. Digital Badges MEAN something! As part of the roll-out of this new system, I created a “Why Digital Badges?” slideshow using a cool presentation tool called Haiku Deck (more on that in an upcoming post). Before you close out this post so you can dash away and start exploring Digital Badges, do yourself a favor and click through this slideshow. I’ll bet it makes a Digital Badge lover out of you, too! Please click on the hyperlink below to view this slideshow. Note: WTPS just rolled out this system two days ago to a beta-testing group of 30 teachers. Within two days, over a dozen badge applications were submitted…..and it’s summer break! Note 2: Beta-testing is a very good idea. The initial group found some kinks in the system that needed to be corrected. Additionally, our district is ONLY implementing this for the elementary staff at this point for very much the same reason. Test small scale first. As always, I welcome your comments, thoughts, questions, and suggestions. You can still always reach me by commenting here at WordPress, on Twitter at @kerszi , or by following My Primary Techspiration on Facebook.